Nothing beats a bicycle tourto enjoy an active vacation—to experience landscape, people, and culture. You will return home with good health, good feelings, and good memories. On any bicycle trip, you see, and hear, and smell (!) local people going about their daily lives. Your pace is ideal for taking in the countryside. (To see the details of cities and towns, I recommend walking your bike, or locking and leaving it at your bike-friendly hotel or hostel.) On any bicycle trip you will get your full quota of exercise, and be able to eat reasonably large meals without gaining weight. The European landscape is both small-scale and open: "Small scale" means that you ride from one village to the next in a few minutes, and do so on minor roads or bicycle paths. Tourist sights, accomodations, and restaurants lie close together. In the European tours discussed on this site, you encounter art and architecture. Flower-bedecked villages and squares, often in a unified architectural style, are filled with small shops. You visit fabulous monuments and souvenirs from a long past of Celts, Greeks, Romans, Arabs, Popes, Cardinals, Kings, and Emperors. 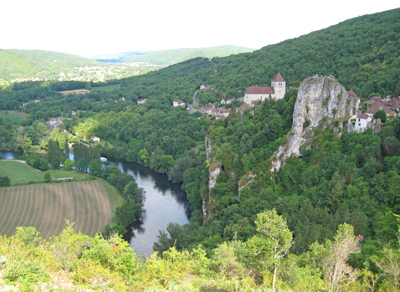 You encounter monasteries and churches; prehistoric caves; alpine vistas. In addition, by biking in Europe, you gain exposure to cultures: different ways of thinking and feeling, different social organization, novel food and drink, and local languages (but most Europeans do speak English as a second language). Biking in Europe is comfortable and safe. Highways and roads in Europe are generally of better quality than in the United States. Secondary roads have almost no pot-holes and traffic is light. Many tours take you on bike-paths, completely isolated from traffic. Accidents are rare. Theft is unusual, except in larger cities. Europe is charming. The charm comes partly out of novelty; and partly from the influence of history: countrysides manicured for centuries, dotted with relics of ages past. In many parts of Europe, people take a relaxed approach to life and put a high priority on beauty and also on sensory pleasures, and/or intellectual and political conversation. It would be hard to single out countries where most people are workoholics: In general, the south of each country is much more relaxed than the north. My experience on all of the rides on this site is that people seem to be the same in a deep sense, but yet that in each country they have their own distinct tonality. The world has internationalized since I began traveling years ago, but there are still noticible differences in food, in drink, and morays. Are you a gourmet, or, a gourmand? Bicycle travelers in Europe can eat more of the old-world delicacies they may crave at wonderful restaurants, bakeries, and cheese shops  with little chance of gaining weight. That's reason enough to spin those pedals in Europe.